EIN vs ITIN number - Which do I need? According to the IRS, ITINs (Individual Taxpayer Identification Numbers) are issued to foreign nationals who have federal tax reporting or filing requirements and do not qualify for social security numbers. 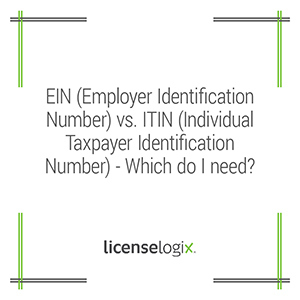 Generally, you must obtain an EIN (Employer Identification Number) if you have employees, your business is an LLC, corporation or partnership, you withhold taxes on income, or you file taxes returns for employment, excise, or alcohol, tobacco and firearms. If you pay contractors, or anyone, for services valued at more than $600 in a calendar year, you may also need an EIN. EINs are used by employers, corporations, partnerships, sole proprietors, non-profit organizations, trusts and estates. You may be required to obtain either or both of these tax IDs, depending on the circumstances. Depending on the state, you may also need to obtain state and local business licenses. LicenseLogix can fully research all tax registration and licensing requirements. We offer the expertise of our licensing specialists at convenient flat rates. Get an EIN now!